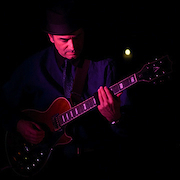 It was around 30 years ago that Carl Weingarten first traveled from St Louis to Philadelphia for a solo guitar concert. For an hour or so he engaged the audience with wondrous tones, layers of notes and ghostly, repeating motifs he called "loops" - all produced (he emphatically explained) in real time, by just him (no tapes), his guitar (no synthesizers), and the several small boxes he was wired into down at his feet. Through the intervening years Weingarten has explored and mastered this and other areas of music, deepening the Multiphase Records catalogue, and gaining the respect of listeners and musicians alike. The common thread that runs through all of his work is the vivid emotional content of a sensitive artist, rendered aloud through competent musicianship and production values. 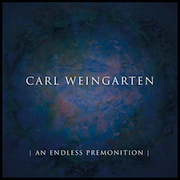 An Endless Premonition (53'54") is an album which seems to have arisen out of Weingarten's ruminations of these early days. Either he felt it was time to re-visit his first fascination with layering and looping, to try it out again with more modern gear and deeper musical insights, or he just wanted to make some music that was solely his alone. The superb results are beautifully restrained, and often achieve the elusive steady state to which Ambient Music aspires. For the most part, the five pieces on An Endless Premonition feel like they were made by a person with an electric guitar - but then sometimes it seems quite ethereal, like a message from another realm is reaching us. Plucked twangs, heading out through silvery reverberation, rise above droning electric strings, and into a magical landscape of hanging metal forms and murmuring digital atmosphere. Glowing moments of surprising tenderness offer a soul-to-soul connection. The atmosphere of expectancy enlarges amidst airy resonances. Sounds divide, then unify. The placid mood breathes, and soon after lightens. As all the ringing and humming of Weingarten's soundspace speaks in clean chords and writhing melodies, the listener will feel an honesty that few can call forth. This album does not push against limits, but rather whirls around inside - between the mind and the heart. An Endless Premonition is a record that saves you when you need it to.